At least for the School of Theology's Commencement Service this was absolutely true. We were blessed to have both the Presiding Bishop of The Episcopal Church as well as retired Archbishop of Cape Town and Nobel Laureate Desmond Tutu as the speaker. 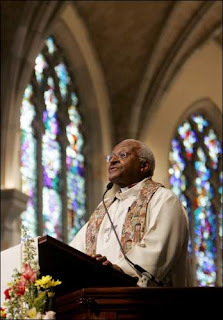 Pictured here: Archbishop Desmond Tutu, Presiding Bishop Katherine, and me. I served as a Sacristan for the service and I was lined up in the Procession in front of the clergy. I couldn't resist getting a photo with these two. Fellow Sacristan Stephen Carson from Texas. Stephen is a classmate of mine and the Carson family are good friends with the Krazy Krouse Kids. Here, the "Arch" preaches inside beautiful All Saints' Chapel at the University. Photo is from The Tennessean Newspaper.